About three months ago I first heard about IOTA and I really liked it. However, it is still in a very early beta stage, and lots of improvements still need to be built. One of the missing features at the moment is an offline wallet. Another project I started with my brother a little over four months ago was to built our very own trezors. We discovered that trezor makes all their software and hardware open source. It seemed like a cool idea to order some PCB’s and components and construct our very own trezors for lower cost. Also, the device is built around an STM32, which I’ve covered many times before on my website. It did not seem to difficult to make modifications to the firmware. 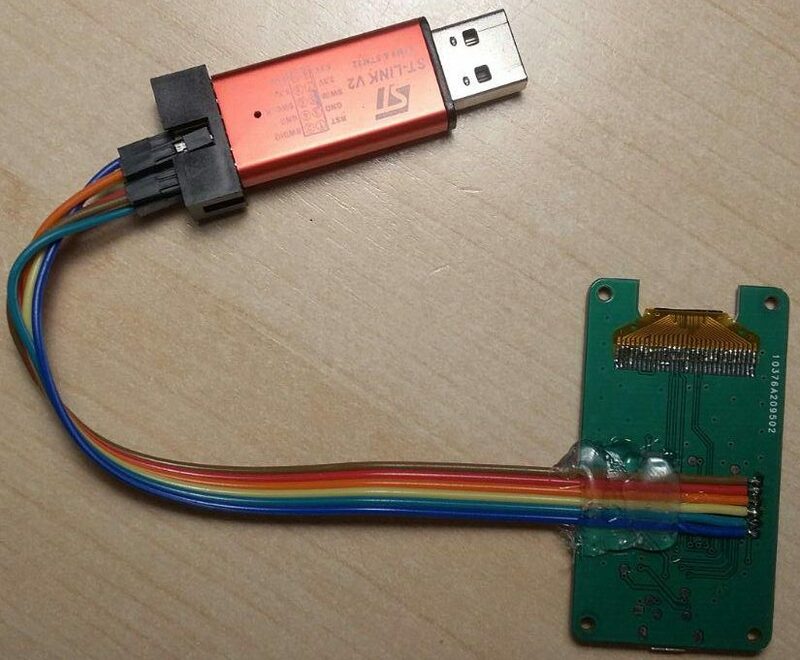 Trezor clone with ST-Link programmer attached. For this development board, I did want to have some flexibility with the bootloader. By default, the trezor bootloader makes sure that the bootloader cannot be erased by enabling write protection. I disabled this for my development board. Also, it checks the signature of the firmware which I am skipping at the moment. By default, the trezor uses a 24 words mnemonic which deterministically generates addresses for various crypto’s. The trezor internally generates a 64-byte long ‘seed’ according to the BIP-0039 standard. IOTA seeds consist of 81 trytes. Deterministic conversions can done between 81 trytes and 48 bytes. Kerl actually does this exactly. But 48 bytes is not 64 bytes, but 3/4 of 64 bytes. I implemented a simple algorithm that chops the 64 bytes from the mnemonic into 4 48-byte arrays. These are then absorbed by kerl and in the end the deterministic seed is squeezed out. I got some useful feedback on this. I will change the method to implement BIP-0032 and BIP-0044. The generation of public addresses is probably the slowest. Each address takes about 12 seconds to generate. Therefore, once the public address is generated, it is stored in the trezors flash memory. The current address is the address holding the value. The next address is the remainder address. The security level is always 2. The bundle always consist of 4 transactions, of which the first one sends value to a receiving address. The trezor will respond to iota_sign_transaction with the bundle hash (which can be used for verification) and two signatures. Generating IOTA address on trezor hardware. After that, I overwrote the signature/message field with the signatures received from the trezor. Attaching to tangle was done with api.sendTrytes(). Proof of work is not done on the trezor. The seed never left the trezor! The very first trezor-signed transaction ever in the tangle can be found here on thetangle.org. Thanks to the organizers of the first dutch IOTA meetup for providing me with initial funds on my trezor. I have no contact with the trezor development team (yet). It would be cool to have a more mature version of this being merged into the official trezor firmware. 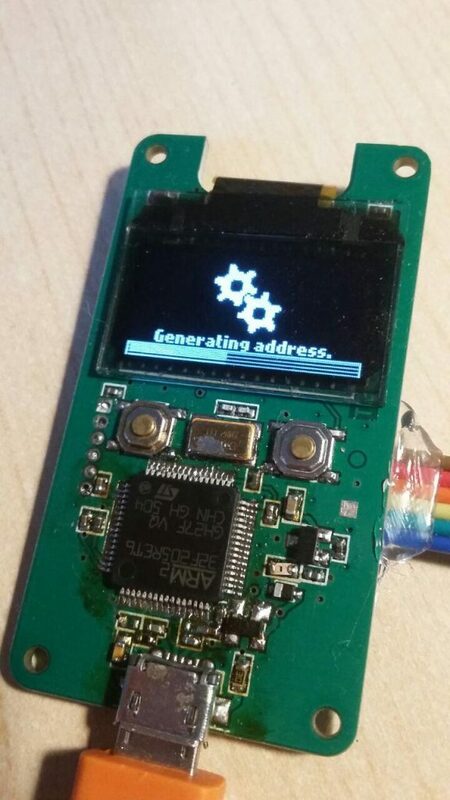 Before that I’ll probably already publish some binary which can be flashed onto an official trezor. However you’ll have to deal with the “unofficial firmware detected” warning. It would also be good to have the source code tripple-checked for possible implementation errors. I tried to prevent bugs in the core protocol by applying the test-driven-development method, but I cannot (yet) guarantee that your IOTAs are 100% safe on the trezor. This is the same address as the one I transferred some IOTA to with my trezor. Congrats, Bart! This is really cool! 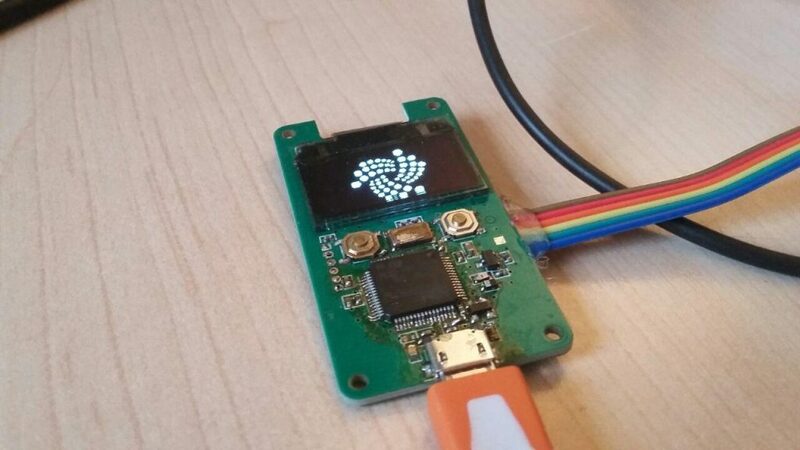 Having a hardware-wallet for IOTA would be such a big step for the community, reduce wallet user errors and put many minds at ease! I’d definitely buy a Trezor for IOTA. TREZOR has already liked my Tweet about your work, so maybe they really are interested in working with you if you reach out to them. Great job, hope they pick up on it! great, hope it will be available in stores soon! Can you mail me when its save to use a hardware wallet? Do i have to reclaim with a hardware wallet? I remember seeing you from researching making a similar wallet! I’d love to talk to you to know more about this process. Maybe we could work together on a project. Hope to hear from you, I wanna know your thoughts on something I’m working on related to this. I’m trying to implement Zen Protocol integration with Trezor, I’d love to ask you a few questions, how can I get in contact with you? The initial one is always to set a bankroll and not exceed it, no matter what the conditions are.